The Targeted Jobs Tax Credit is probably the most outstanding example of a generous entitlement program with very low participation rates. Only about 10 percent of eligible youth are claimed. The causes of the low participation rate were analyzed by estimating a poisson model of the number of TJTC eligibles hired and certified during 1980, 1981 and 1982. Information costs, both fixed and variable, were found to be key barriers to TJTC participation. The cost effectiveness of TJTC is low because the stigma and recruitment costs of hiring additional TJTC eligibles are very high. Employers find it relatively cheap to passively certify eligible new hires who would have been hired anyway so this mode of participating in TJTC predominates. Bishop, J. H. & Kang, S. (1988). 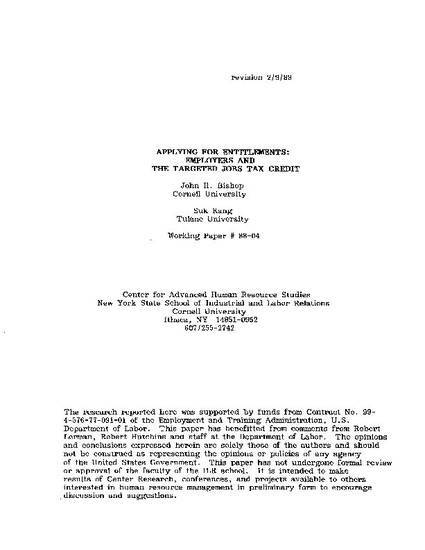 Applying for entitlements: Employers and the targeted jobs tax credit (CAHRS Working Paper #88-04). Ithaca, NY: Cornell University, School of Industrial and Labor Relations, Center for Advanced Human Resource Studies.